Excavating and preserving the ancient bath house has been a true dedication of love and faith on the part of Elias and Martina. With no government or academic financial support, they have worked tirelessly and have spent their own money to make sure that this treasure is not buried and forgotten. Elias spent over 5 years excavating the site, while at the same time running the Cactus gift shop. They have endured times of great hardship, and practically no income, during the 3 years excavations of Mary's Well and the 2nd intifada, both of which either completely or nearly completely closed the shop. Yet they did not leave, nor quit. And while they have thus far been able to hold on to their business, and the bath house, in the turbulent environment of Israel, it is hard to predict what other difficulties will come. Further, their current income from Cactus, can only maintain their subsistence, and does not allow for them to continue excavating, nor to further renovate the site. 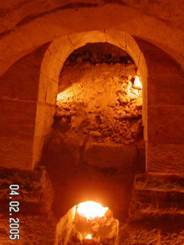 It is their dream to excavate and restore the bath house area, and so reveal an important part of Nazareth’s history and ensure this unique heritage will be left to the world for all the future generations to come. 1. 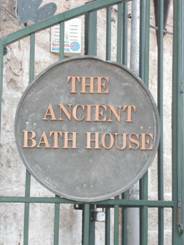 Visit the Bath House. Come see for yourself the treasure that Elias and Martina have uncovered. 2. Link to our Website. If you have a web page, blog, or write for a publication, please think about sharing our website and our archaeological site with the world. 3. Donate to the Dream. In order to fully accomplish the full possibility of the bath house, the full site needs to be purchased, and a full excavation needs to occur, which the Israeli Antiquity Authority requires being paid to supervise this excavation. This dream requires a great amount of financial support, and small or large donations will help us to get there, and allow you to be part of making history. 4. Shop at the Cactus Gift Shop. Since Elias and Martina put most of their personal funds towards the bath house, shopping at the store directly helps the project. The store sells only quality items, that are authentic. Mostly hand made in Israel. You can shop in person when you visit, or from the website, or request a catalog.